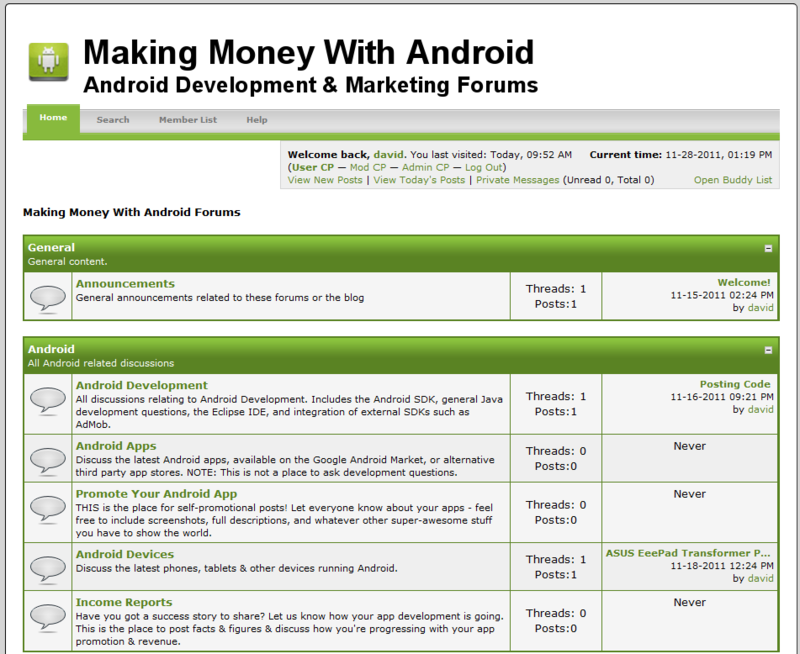 There are already quite a few Android forums out there, but most of them have a very wide scope, and cover everything possibly related to Android. I’d like this forum to be a more specific, focussed site, with an emphasis on helping indie developers build a profitable business from Android apps. There’s a lot of common code (such as XML layouts for AdMob) which I see a lot of new developers struggling to create from scratch. If we could compare best practices and code samples, I think it could be of great benefit for new & experienced developers alike. At least, I always get some benefit from reading others’ well designed code, especially if it takes a different approach to what I would. It would also be great to get some discussion going about monetization strategies – for example, which are the most effective advertising networks to use? Just about every day I discover a new network, but it’s often difficult to find developers writing about their experience with different services. So if you had to sum up the topic of this forum in one sentence, it would have to be “Making Money With Android” (oddly enough!) 🙂 It’s a place for developers to share strategies, experiences, and code on their journey to making money with apps. In many ways it’s an extension of this blog, but with the opportunity for everyone to contribute, instead of just having one voice. Of course, I’ll still be blogging here. But if you’ve got any development questions, or feedback that you’d like to share with the community, I’d encourage you to drop by the forum. There are a bunch of fantastic people out there in the Android world, I’m sure there are some great discussions just waiting to happen.